Today I want to share some books by American author Bob Barner. But before I introduce him to you, I wanted to point you to the wonderful blog that started this journey of ours. I referred to it back when I started this blog, but wanted to highlight it again. Reading My Library is the project of Carrie over at Reading to Know. While she hasn't been posting as of late, it's still a wonderful resource for children's book reviews. Anyways, on to Bob Barner! 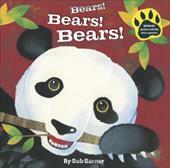 This book introduces us to a variety of bears from around the world. We meet grizzly bears, panda bears, black bears, as well as some bears which would be less familiar to a US audience such as spectacled bears. Barner's vivid collage illustrations are very engaging and the rhyming text gives good factual information about each type of bear. At the end of the book is a world map showing where each type of bear can be found. Jonathan enjoyed looking through this book with me and had fun trying to name each type of bear. I highly recommend this for any bear loving child! 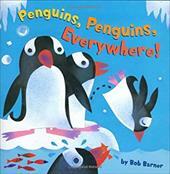 This nonfiction book is a very toddler-friendly introduction to penguins. Barner's collage illustrations introduce seventeen different varieties of penguins. The birds are shown engaging in a wide variety of different activities from swimming to tobogganing. The short rhyming verse describes the birds and relays information about different varieties of penguins and what they like to do. At the end of the book is a chart comparing the different penguins. Barner's style easily held Jonathan's attention. A must for any penguin-loving child or a penguin unit study! Can you sense a theme with these titles? This particular book focuses on the solar system. It teaches about stars, planets and constellations while featuring Barner's vibrant collages and simple rhyming text. While the information is now a little dated-- Barner includes Pluto among the planets-- it's still a very visually appealing introduction to stars and outer space for toddlers and preschoolers. Barner has also written several longer nonfiction books that would be appropriate for preschoolers and lower elementary students. His books are well worth including in a toddler's library! 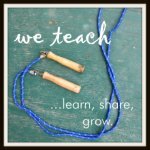 I'm linking up to Read Aloud Thursday over at Hope is the Word. We will be doing a space unit soon so I will be sure to check out the stars book! Don't think I've ever read his books before but I love new living books! visiting you from Read Aloud Thursday -- these look like great books - I will have to check them out! Thanks!